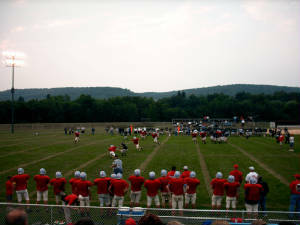 Fans of Johnstown and Cambria Heights got one final look at their squads this past Friday night as the Trojans and Highlanders faced off in the second and final preseason scrimmage prior to the start of the 2005 high school football season. The Trojans took the ball first and the first team came out in a doubles, one-back formation and showed a bit more on the offensive side of the ball this week. JHS went to air initially with a 9-yard pass to Xavier Thomas. That was followed up with a nice run by Antwuan Reed. The third play of the series was stalled by a false start penalty by Trojans but it only delayed the inevitable. Following the 5-yard mark off Reed hit the whole beautifully and went in for the score. With seven plays left in the series, the Trojans mixed it up with four runs and three passes, however they did not score again on the initial series of the scrimmage. The final play was a long passes completed to #85 however he was brought down short of the goal line. What the Highlanders lacked in numbers (27 players dressed) they made up for in heart and grit. They took the first play their offensive series on the ground for a nice gain. However, that did not get them in the end zone during the series as they kept the ball on the ground for all but two plays in their first offensive set. Only one of the other runs had a significant gain. Attempts at runs between the tackles were pretty much stuffed and the Trojans did a great job of containing the outside on two sweep-type plays. Reed did a particularly nice job from his defensive back position on play six of the set to string out a run on an end around handoff. Dan Weaver came out with the ones for the second series on offensive for JHS but other than a pass completed to Thomas and a nice gain on an end around by Reed, the drive sputtered. There was a fumbled exchange on an attempted option on play two, a sack on play six and a busted play on play eight when a handoff exchange did not go too smoothly. Needless to say, the Trojans failed to get in the end zone this go around. Cambria Heights took the ball back and although they gained nice chunks of yardage at the beginning of the series to move the ball downfield they were stuffed at the goal line by the Trojan defense. The entire series saw the Highlanders keep the ball on the ground and they moved the ball nicely the first four plays. JHS stopped them the next three plays but on play eight another big gain on the ground got the Highlanders deep in the red zone. However as previously mentioned, the Trojans’ defense kept the Highlanders from scoring. The first team, at least for the Trojans, was done for the night when JHS took the ball next. The second team offense went to the air a little bit and was successful as #20 hauled in a pass for a touchdown on the eighth play of the set. The other plays that went to the air in the set were play three which was an incompletion and play four which was a nice catch and gain from #27. #37 made a nice gain on a pitch left on the final play of the series, but was unable to score. The Highlanders second team mixed it up on the ground and through the air as the run drove them downfield and this time, the Highlanders closed the deal but through the air as on the final play of the drive they scored on a touchdown pass. There were two other pass completions on the drive and it appeared as if the backup secondary may need a little more work. A bright spot for the Trojans would have to be #37 as he took the first play of the next offensive series to the house. Then, the very next play, #28 took another handoff and achieved the same result. Another bright spot in this series was the passing of the left-handed quarterback #7. He really threw some nice deep balls and although he was only 1-of-5, one was dropped and it appeared that a wide receiver stopped running his pattern on the other. Cambria Heights’ backups took the final offensive series and were unable to score on the JHS backup defense. They did move the ball on the ground well during plays two through four but got stopped for a five yard loss on play five. They gained that back on play six but then stalled out, although they had a nice catch and gain on the final play of the series, they were stopped short of a score. The coaches then gathered each of their squads for the traditional handshake and that was the end of the evening. All in all, it appeared that the Trojans looked a bit more crisp on the offensive side of the ball (that goes for the ones and the twos) but there still is some work to do to get the team in game time condition. Aside from the afore mentioned potential issues with the backup secondary, both defensives looked solid displaying a bend but not break mentality as the ones did allow some big gains but did not allow a score. Next week it’s for real, as the Trojans host Central Friday night at Trojan Stadium. The Highlanders will face a tough test early as their week one opponent is Bishop Carroll in a game that will be played at Central Cambria Stadium.